I had to go to Dubai for a job. All I really got to see was the exhibition centre where the work was and the hotel. Once the job was finished, I had a free in Dubai, and 2 in Oman. Someone told me about a shopping mall with a ski slope in it, so I headed there. It was deserted, full of (empty) luxury designer shops. The islamic morning prayer came out on the PA while I was there, which kind of sanctified the mall. An ode to consumerism. 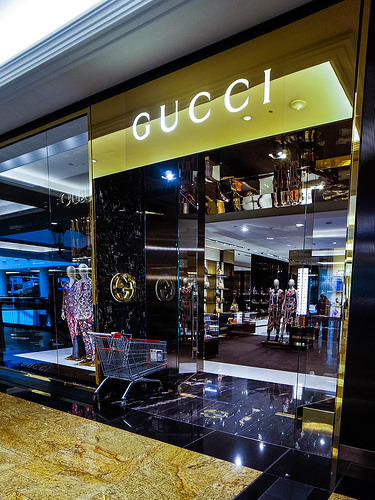 Found a shopping trolley parked outside the gucci shop (pictured). There was also virgin megastore there. Maybe people actually buy CDs there, rather than downloading. It’s not impossible to access pirate bay there. Ahh, the actual ski slope looked pretty cool. You could do Zorbing there too (that sport where you climb into a big plastic transparent sphere and roll down a hill in it.) There was a conveyor belt to take you back up to the top of the hill in your zorb. It reminded me of the bit in Indiana Jones when he steals the idol and is chased by big stone balls (which look like they’re made of polystyrene). On the metro, the stops are announced in prerecorded Arabic, then in English. When the English voice reads out the stop name, it makes no effort to use the actual pronunciation, it’s just read phonetically off the page. 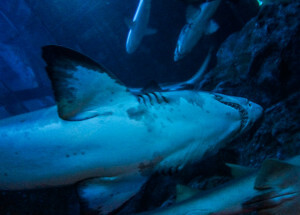 Went to the world famous aquarium and was disappointed. The sharks were cool, though. Dubai is just lots of brand new tall buildings. We visited the oldest part of town – the souk (market), and by old, that means 1970’s. Coming to the Arabian peninsula, I really wanted to get a bit of local culture, but I wasn’t going to find it in Dubai, so I jumped on a plane to Muscat, the capital of Oman. This entry was posted in Dubai on 13/03/2014 by marek.